12th pick, not too happy with it but it's just a random public league. 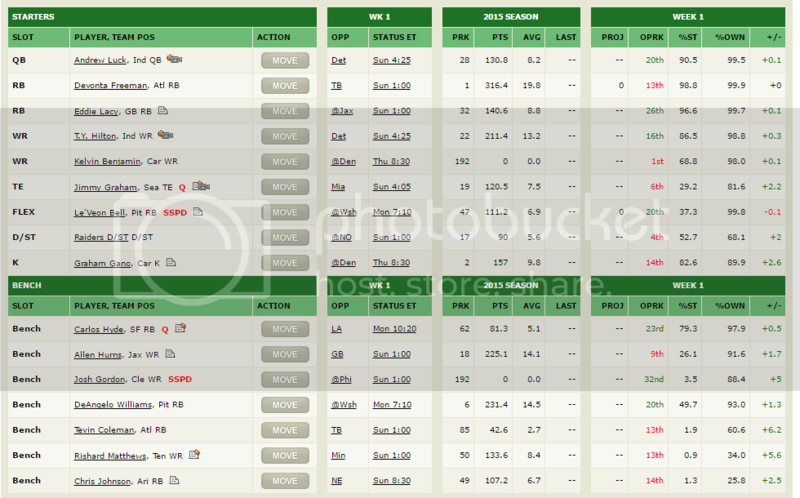 My biggest concern is Bye Week 4 for Rodgers and 5 for Fleener. I hope by then some of my sleeper picks have made themselves clearly known flops. Sent Crowell, Matt Jones, and Lockett to a guy who lost everthing at RB. In return I got AJ Green and Ebron. If either Ivory, CAP, or DWash wake up and become their teams workhorse, I will be sitting quite pretty. Just wanted to post how stacked my team is in my most serious (cash) league. 7-4 mostly due to my 2 TEs missing the first half of the year. Doctor wrote: How many teams?